We are Denver natives and were the marketing arm of ASC-Pacific when they opened the first architectural metal manufacturing plant in the Rocky Mountains 40 years ago. We service Colorado with our own trucks. We ship nationally and internationally at preferred pricing. We are the largest specialty metal supplier in Colorado. We go from Telluride to Aspen to Steamboat every week. Our list of satisfied customers are second to none. We've helped professional athletes, rock stars, and other well known celebrities, athletes, musicians, and well known Coloradans. We've also worked with The Ritz Carlton, and the Colorado State Capitol to name a few. 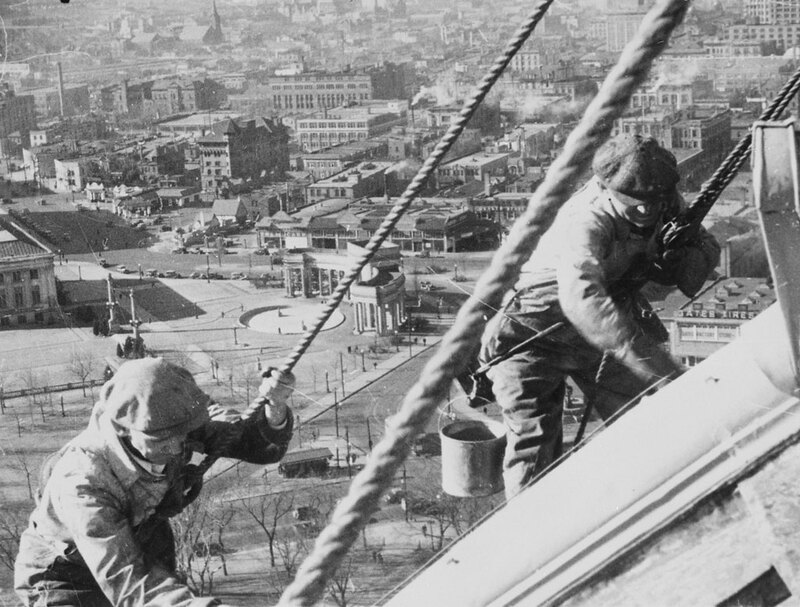 Civil Works Administration (CWA) workmen cleaning and painting the gold dome of the Denver Capitol, 1934. Schafer & Company recently completed the refinishing of the gold dome. We have supplied materials for projects: Aurora Justice Center, Broadmoor, CU, CSU, DIA, Denver University, the Colorado State Capitol dome, Sports Authority Field at Mile High, and the Molly Brown House to name a few. Some of our contractors include Academy, Alliance, Arapahoe, B&M, Concord Metal, D&D Monarch, and Douglas Colony Roofing. In the last 40 years, we have diversified and grown, yet we still have the #1 team of employees and represent the #1 manufacturers of products in each area. We continue to manufacture and fabricate unique product and custom architectural projects. Schafer and Company is a rep for Roll Former Corp, New Tech Machinery, and KMW Rollformers. We are proud that over the last 40 years, we have assembled a high grade team that can solve most architectural metal questions. We can produce, supply, and deliver your architectural metal needs.